The fate of a small start-up business in any industry is precarious. The four year failure rate is over 50% and I would expect it is even higher for two-channel audio companies. Expertise alone rarely guarantees success. Often it's the mundane areas such as overhead, costing and cash flow which determine the life or death of a small business. Such is the story of the original Tenor Audio. It started with the passionate leadership of François Lemay, followed by Robert Lamarre and with the engineering brilliance of Michel Vanden Broeck. Formed in 2000, they hit the ground running and started out with a home run. 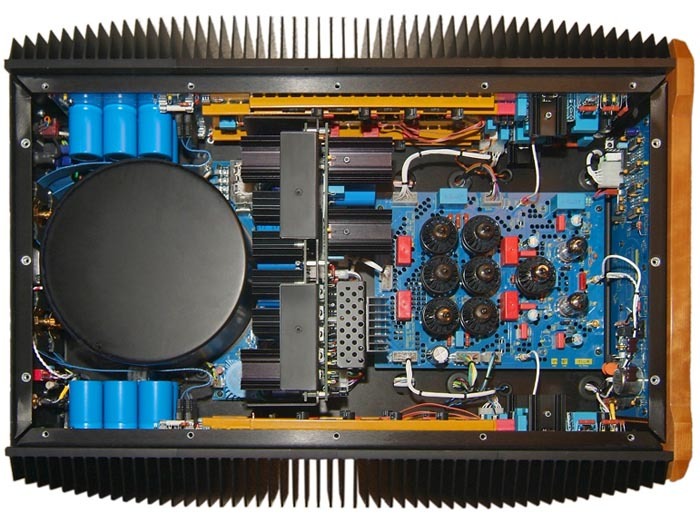 Their first product was the outstanding 75i OTL amp, with stellar reviews in Ultimate Audio and the Absolute Sound and as the darling of the internet audio groups; it appeared that Tenor was headed for greatness. Unfortunately the old business adage is true: there are two things that can strangle a business - growth that is too slow or growth that is too fast. In Tenor's case, it was the latter. I was one of those crazy audiophiles who -- as a consumer -- purchased a pair of 75i Tenor monoblocks unheard from the Internet. It didn't take long to understand what the fuss was about. The 75is were a magical mate with my Wilson X-1s. These babies did a lot right but unfortunately had two flaws: the bass articulation and control was not up to the best solid-state and then there was the heat. My wife and I do multi-hour listening sessions and in our medium-sized dedicated room, these diminutive heaters disguised as amplifiers made long-term listening impossible. After about one hour in a sealed room, the temperature would rise into the 80s, eventually reaching the point where one could no longer reasonably focus on the music and forcing us to bring our listening sessions to a premature end. Keeping this in mind, I was extremely interested when I heard in 2003 that Tenor was launching a hybrid. If they could capture that OTL magic without the OTL heat and add some high power and low-end control, they would certainly have a winner. I heard the 300s briefly at the HE show in New York in '04. The room and the sound didn't quite do it for me but it's a mistake to make decisions based on show conditions. 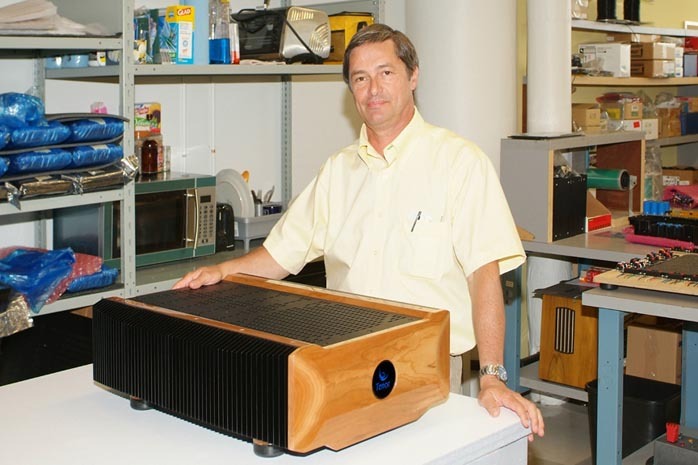 To evaluate the amps in a controlled environment, I contacted Tenor requesting a review of their new 300s and received a call back from François Lemay, their managing director. He talked briefly about the success of the 300, its tonal beauty, musical attributes and belief that they truly had created something special. He then announced that Tenor was closing. He promised a return someday with a new, stronger Tenor and promised to contact me when Tenor was reborn. At the time I considered it sad and unfortunate that this technology was probably lost. I took François' hope for a new Tenor company as a naïve dream and went about my way. Fast forward to 2007 when I received an e-mail from François announcing a new, vibrant Tenor Audio, a new reference amplifier and an invitation to audition the amp in Montréal. To say that I was surprised was a mild understatement. François suggested a factory tour and due to some fortuitous timing, I could combine the visit with a sampling of the Montréal Jazz Festival. Together with my wife who is also my audiophile listening partner and personal editor, we hopped on the short flight from Philly to Montréal. Packed into a tight three-day trip, we had a whirlwind tour of the city, a brief taste of the Montréal Jazz Festival, a factory tour, meetings with the Tenor principals and a personal interview with François [below]. Let's just say that we definitely were not bored. I've always wanted to visit Montréal. Its multicultural mystique has intrigued me, yet it was one of those in a vast list of things that you say you're going to do but never quite get around to. Now with the Tenor factory tour invitation, it was the perfect opportunity to mix business with some pleasure. During the three-day period, we spent a lot of time with the Tenor gang but also added in a little sightseeing; it was an opportunity to experience the culture and a touch of the Montréal Jazz Festival. Although perceived as a French city, Montréal is, more correctly, bilingual. Half of its inhabitants speak French as their primary language, with English, Italian, Arabic, Spanish, Chinese and many others statistically filling out the remaining indigenous cultures. It's international, cosmopolitan and diverse. Although not academically schooled in the arts, I have a strong love of architecture and history manifested through my photography. 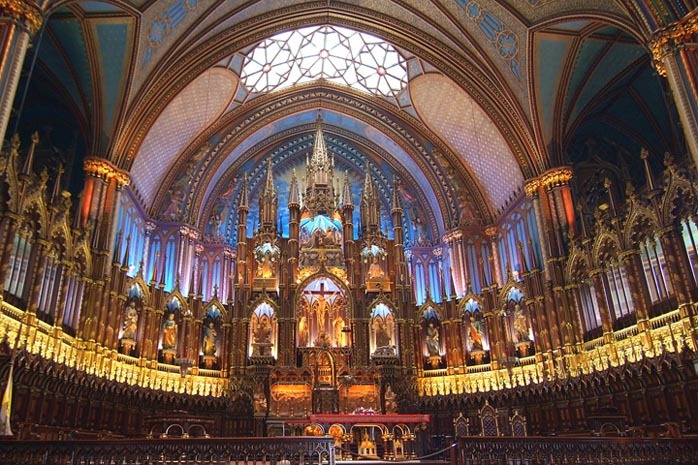 With its largely Catholic population, Montréal's cathedrals are magnificent architectural masterpieces. 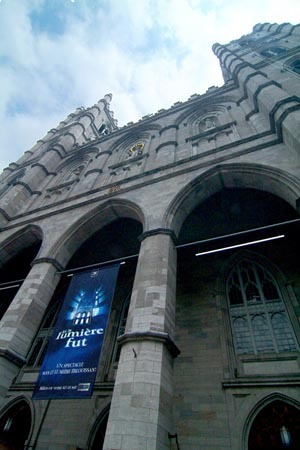 Close to my hotel was the dramatic neo-gothic Notre-Dame Basilica. While most churches showcase wood, stone and gold, the Basilica explodes with a rainbow of internal colors highlighted by brilliant azure blue. A confluence of polychromatic reds, golds, blues and pinks made this a luscious visual and photographic treat. Overall, we found Montréal to be delightful. On this, my third visit to Canada, I continued to find Canadians to be unfailingly polite, helpful and cheerful. Being somewhat jaded and having lived my life in the rough 'n' tumble metropolitan Northeastern United States, I expected Montréal to have more of a prototypical large city persona and indifference. But the same charms that I found in the northern reaches of Nova Scotia exist to a large degree in Montréal. I was wonderfully surprised. There appears to be a seamless merge of the French and English heritages with an interesting and wide variety of culture. The city has an intimate feel yet with big city amenities - waterfronts, great restaurants, history, art, music. Yes, Montréal seems to have it all. The unique diverse culture and designs have been recognized by the United Nations, naming Montréal as "World capital of design" - and it is also listed as one of the world's cleanest cities. Full of contrasts, with the old and new blending seamlessly, cobblestones on one street, skyscrapers on the next, yet somehow it works. Even with cultural attractions scattered throughout, the downtown area and historical section are easily navigable on foot. For the more distant reaches, Montréal offers clean and modern public transportation. I'm not saying that Montréal was perfect. In my short visit, I could see that they struggle with maintaining their unique culture while fighting the ever homogenizing McDonald's and Home Depot invasions. Their waterfront seems to be in transition and what exactly does one do with a 60,000-seat former Olympic Stadium? But these are minor blemishes. Overall, from the magnificent Notre Dame Basilica to the vibrant Jazz Festival spread throughout the city, Montréal certainly left a positive and lasting impression. I would have loved to have had a couple of weeks to more thoroughly explore the city. When François described the Jazz Festival, nothing that he might have said would have prepared me for its true size and scope. I initially imagined a few rotating venues and some outdoor concerts spread out over a few days but never in my wildest imagination was I prepared for the magnitude of an event that draws two million people over a ten-day period. The statistics are staggering - 2 million attendees, 3,000 artists from 30 countries, 650 concerts (mostly free), 10 outdoor stages and 10 indoor concert halls. The Jazz Festival has been named by the Guinness Book of World Records as "the largest event of its kind on the planet". Over its 27 year history, 30 million people have attended the Festival. Amazingly, something of this immense size actually has no cost to the taxpayers of Montréal. Funded by corporate contributions and tourist dollars, the Festival generates a large, positive net economic impact for the city. 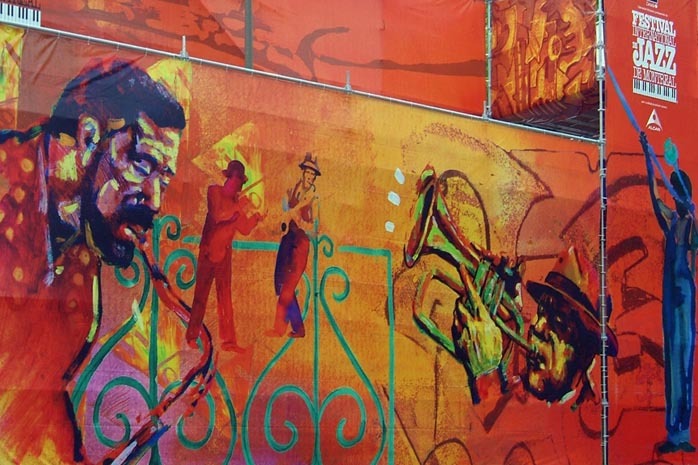 The Jazz Festival envelops and consumes the city in an eclectic mix of every possible jazz genre and sub genre. Unfortunately due to time constraints, the Festival was a mere sampler for my wife and me, as opposed to the immersion that it deserved. One could easily spend 100 hours over the Festival diving into both the mainstream and obscure jazz world. Unfortunately I only had a few hours here and there, but delighted in the time available to this experience. 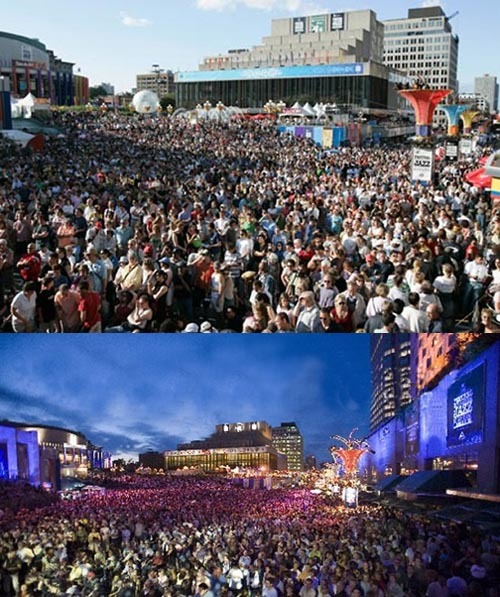 The Festival is centered on the huge Place des Arts, a part of a large central city plaza. A huge outdoor stage greets visitors to the plaza with an additional ten venues all within a few blocks' walk. In the surrounding streets small mini concerts are held throughout the day, rotating with the acts on the main stage. 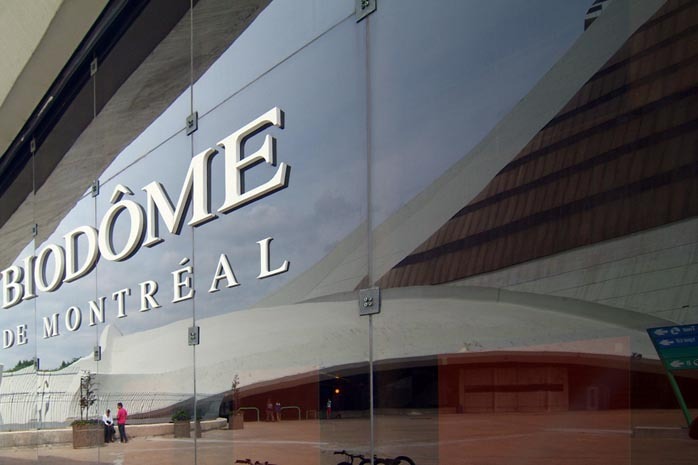 The centerpiece of the plaza is the Salle Wilfrid-Pelletier Theater, the largest general purpose venue in Canada and home to the Montréal Symphony Orchestra and Opéra of Montréal, with restaurants, museums, hotels and shops interspersed throughout the Festival area. In the evening, the Festival really gets cooking. The Plaza fills up and performances are held throughout small clubs in the city. A nightly headliner show is held in the 3,000 seat Salle Wilfrid-Pelletier Theater, with the international list of performers transcending genre. How about Bob Dylan, Keith Jarrett, Harry Connick Jr., Winton Marsalis, Manu Chao, Francis Cabrel, Oliver Jones, Bela Fleck, Van Morrison? These were just some of the top name artists and a mere tip of the musical iceberg. Dig deeper and you'd find hundreds of interesting and eclectic performances stretching the musical fabric of your soul. The nomenclature 'Jazz Festival' is somewhat of a misnomer I think. Think of it more as a music festival with jazz at the core, yet with tentacles reaching in to a dozen other musical categories - African, International, Blues, Electronic, Middle East, Arabic, Latin Big-Band, from the mainstream to obscure, and from small street performances to headliners filling the main concert hall. I, unfortunately, admit my lack of jazz knowledge and history. This presented no problem, however. You don't need to be an expert to delight in the experience of dining at a superb outdoor café while enjoying the sounds of young Israeli group Marsh Dondurma, who serenaded us with an unusual blend of Middle Eastern jazz mixed with funk and a little Klezmer. Now, contrast this to the after-dinner closing concert, consisting of the double billing of Canadian Jazz greats Oliver Jones and Susie Arioli, and you have some idea as to the diversity in performances. I don't know the sound equipment details but from a sonic perspective, the music was not only artistically well presented, the sound quality too was outstanding. The acoustical quality of massive outdoor concerts is often hit or miss. Whether enjoying the music from the giant outdoor stage, up close or from hundreds of yards away, the sound reinforcement combined with multiple projection screens allowed all Festival goers to have a great musical and sonic experience. I can't imagine any music lover who would not enjoy both the familiar and new genres of music at The Montréal Jazz Festival. It is really not an end in itself but more a voyage of discovery and my initial introduction was nowhere near sufficient. I'm already making plans for next year's concerts.